Sweet, earthy and caramelized baby beets are divinely paired with a tangy lemony tahini drizzle for an easy dish that’s just as perfect as a nourishing side as it is for a simple lunch or dinner! 2 Ib baby beets (about 7 baby beets) Washed well and cut in half or quartered if large. Toss beets with garlic slices, thyme, olive oil, salt and pepper. Place on a rimmed baking sheet and roast until tender, about 45-60 min, depending on the size of your beets, and toss halfway through. 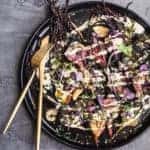 While the beets are roasting, prepare the tahini drizzle. Add the tahini, garlic, lemon juice, cumin and salt to the bowl of a food processor and blend until smooth. It will thicken as it emulsifies. Add a little bit of water, as needed, to thin out, until you reach the desired consistency. It should have a runny, salad dressing-like consistency. But if you prefer tahini more as a dip, simply use less water. Remove beets from oven. If using larger beets, peel skin off and cut them in quarters. If using smaller beets, they should have been pre-cut and the skin can be left on. Arrange beets on a platter and drizzle with tahini. Sprinkle beets with za’atar, parsley, lemon zest and/or a handful of microgreens, flaky sea salt and enjoy your creation! Any variety and size of beet will work so if you if you cant find baby beets just use the larger ones. If using larger beets, roast whole then peel skin off. Cooking times will vary depending one exact size of your beets. When a fork can easily pierce through them, they’re done! If you don’t have a food processor, a whisk and some good ol’ elbow grease will work too for making the tahini. Make extra sauce to drizzle on anything and everything. You’ll want it! If you cant find za’atar, simply omit.